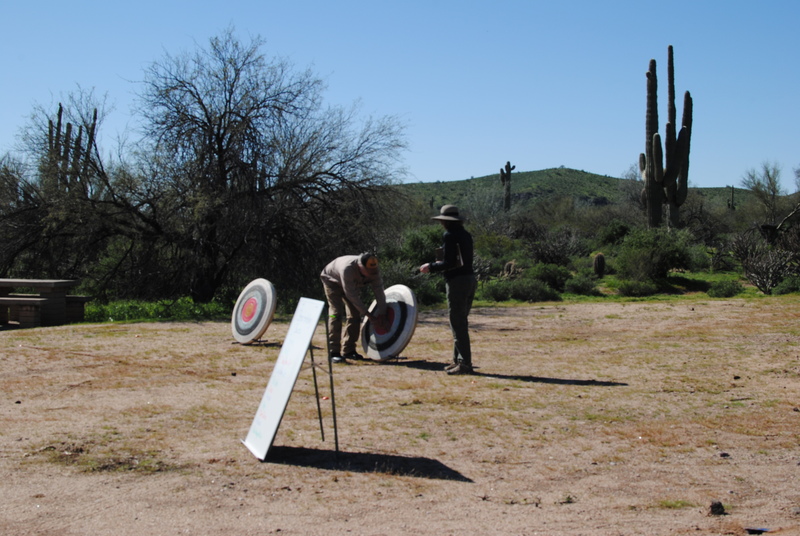 But today, I took time out to participate in something I’ve always found interesting… Archery, using a compound bow. 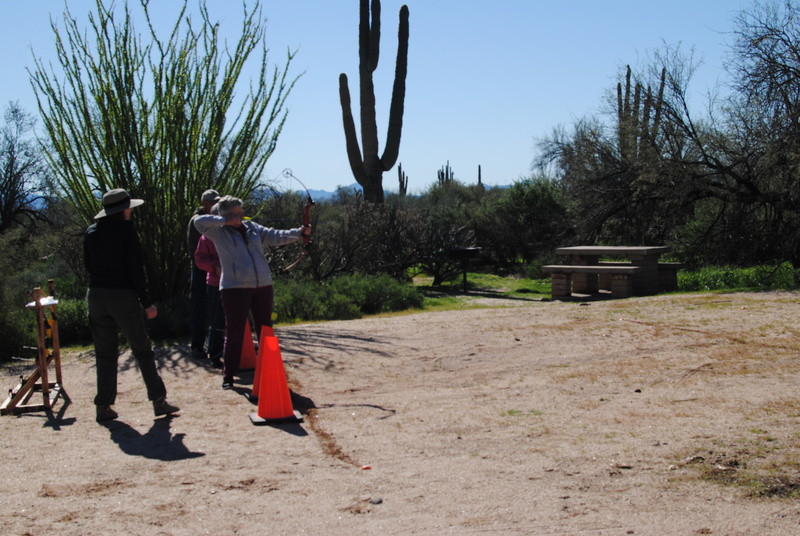 I wanted to document my lesson for our daughter, Shantel, and any of my family/friends that care to know. 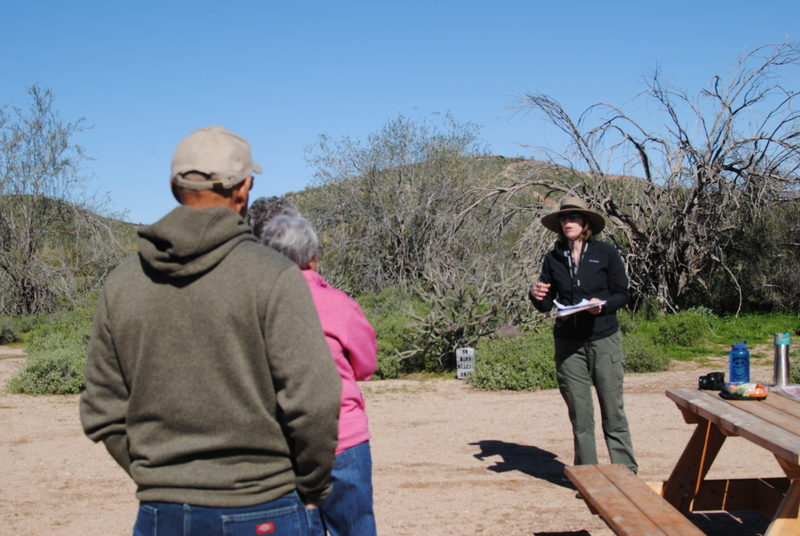 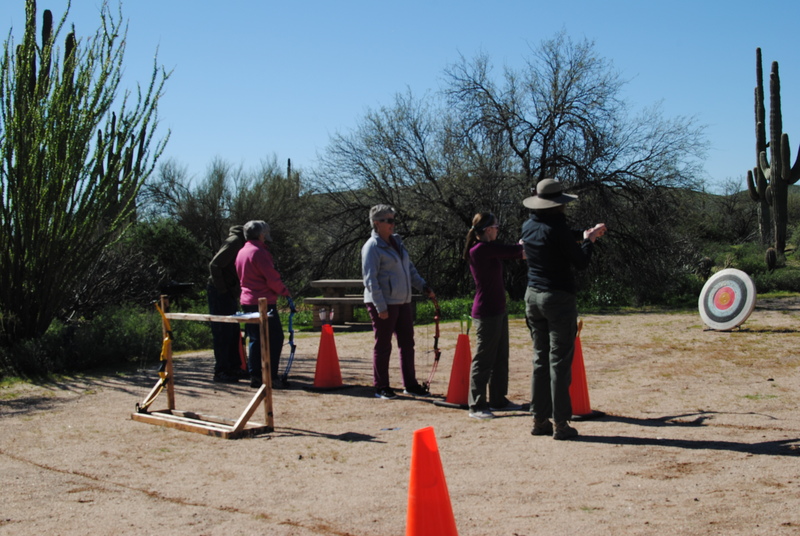 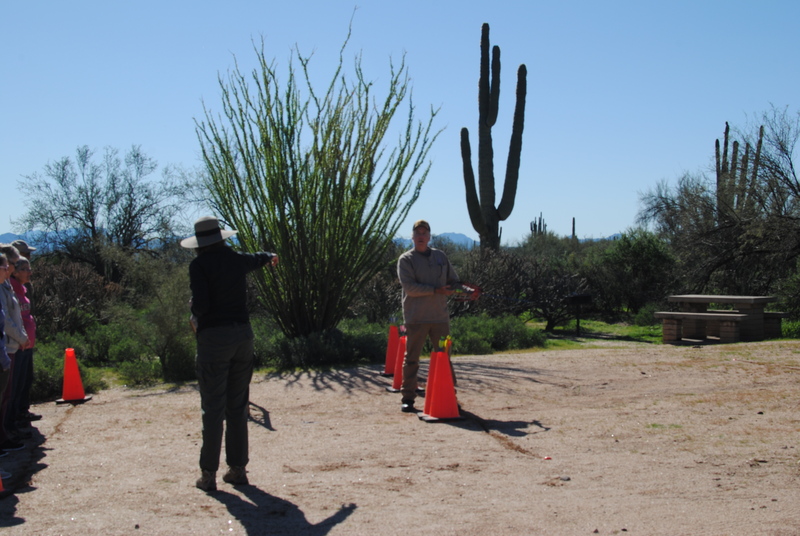 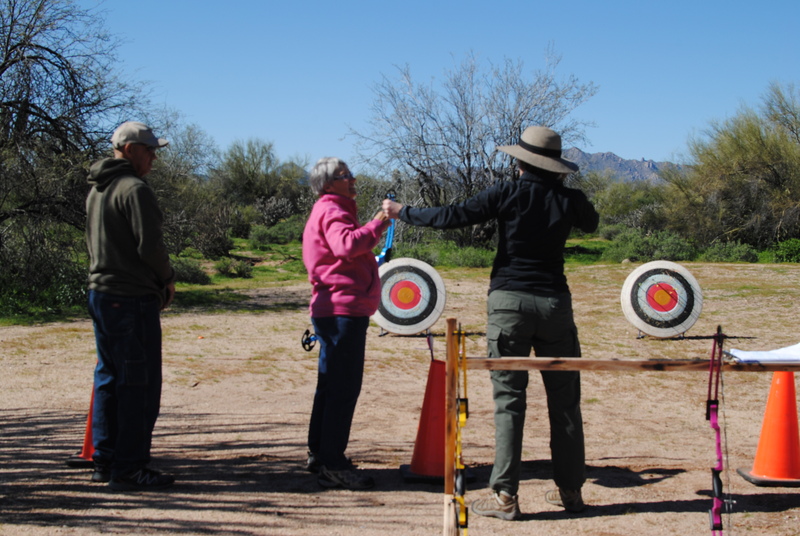 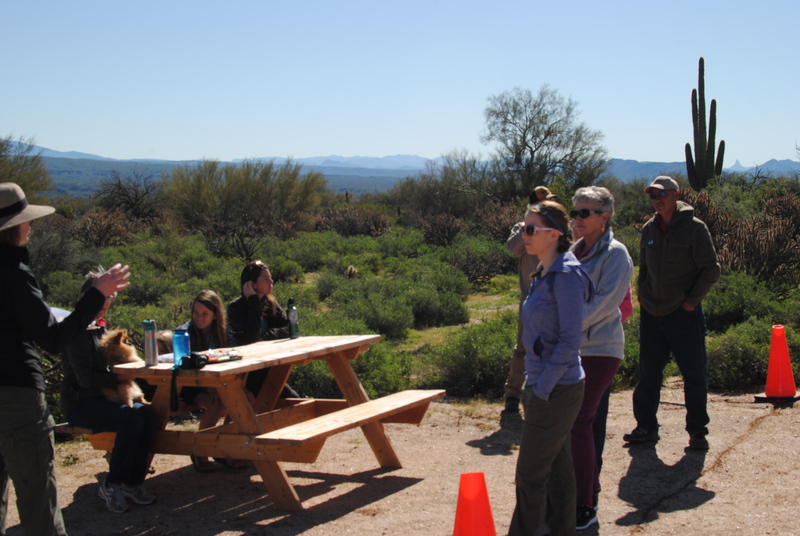 Our Ranger, Amy, here at McDowell Mountain Regional Park, offered an introduction to archery to any of the park host, or park staff, that cared to participate…Well I was all over that offer! 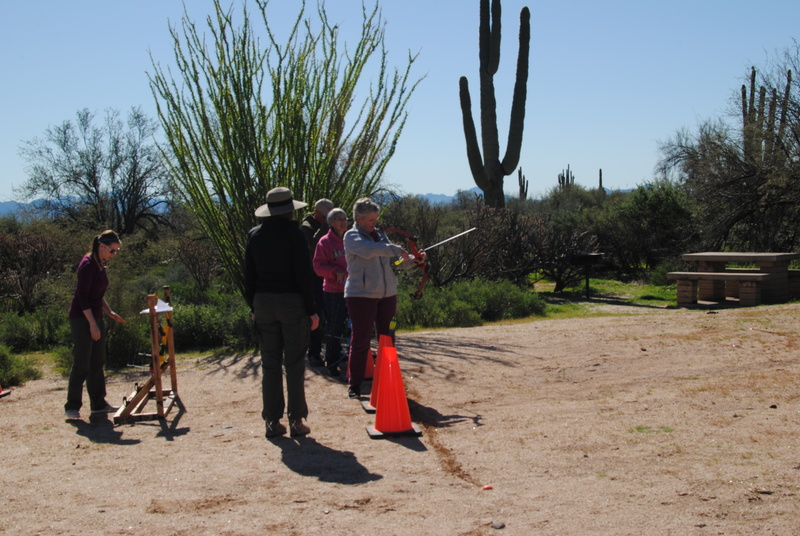 This class was held just beyond the North Trail, and turned out to be the perfect space to get an idea of what archery, with a compound bow, is all about. 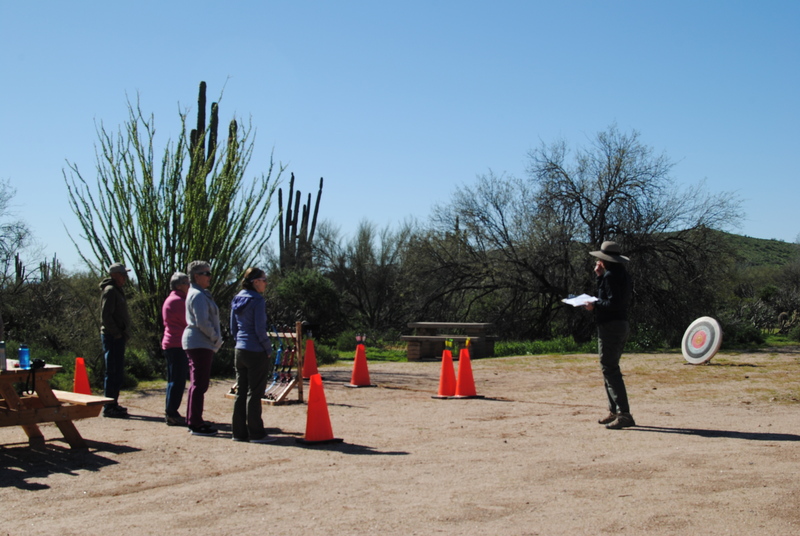 Amy is the perfect person to introduce newbies to this sport because she is so calm, has the patience of a saint, making the whole experience not only a learning experience, but also FUN!!! 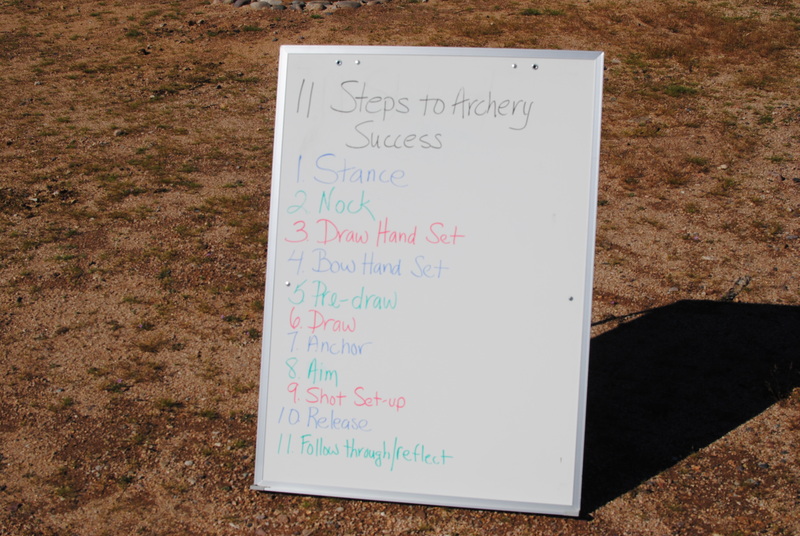 Straight away Amy explained the 11 steps to archery success as outlined on the whiteboard below. 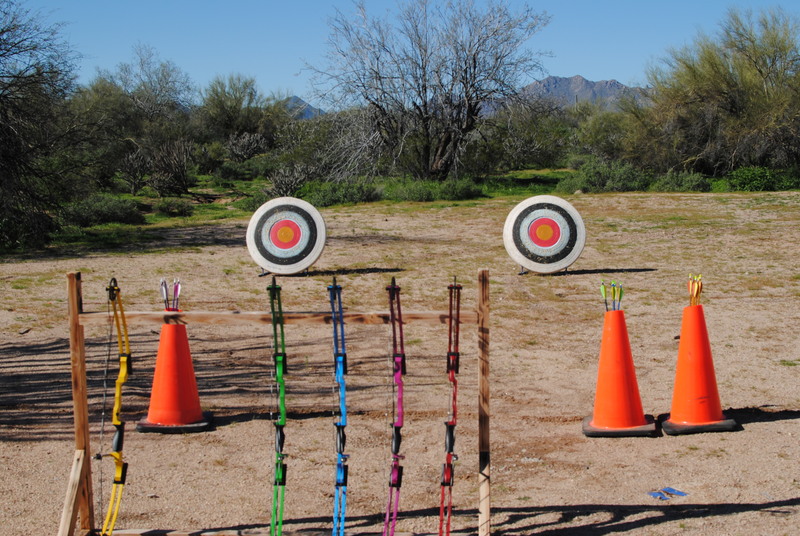 We also learned that you NEVER, EVER, “dry shoot” and that means you never, ever, pull the bow-string on a compound bow and release without an arrow…because that can really mess up the pulleys on a compound bow. 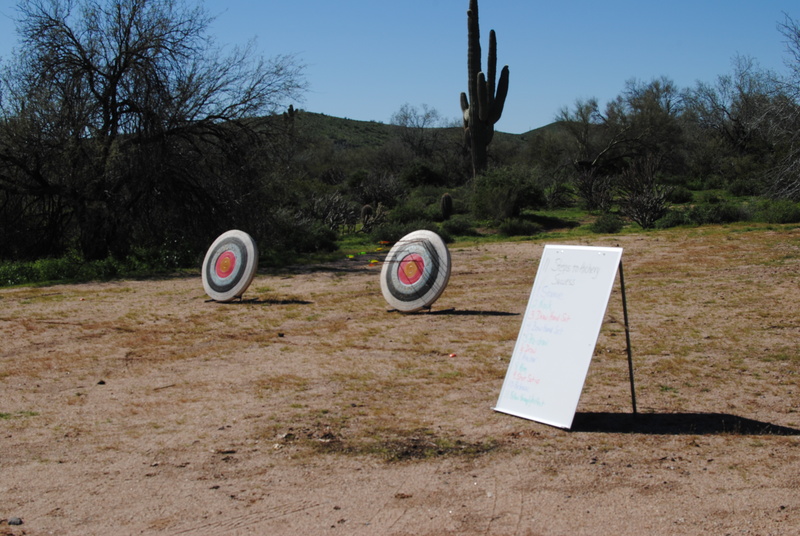 And hitting your target… One of my arrows landed in the white section of the target, one in the black section, two in the red and one landed at the very top of the yellow section… OMG.. What FUN!!! 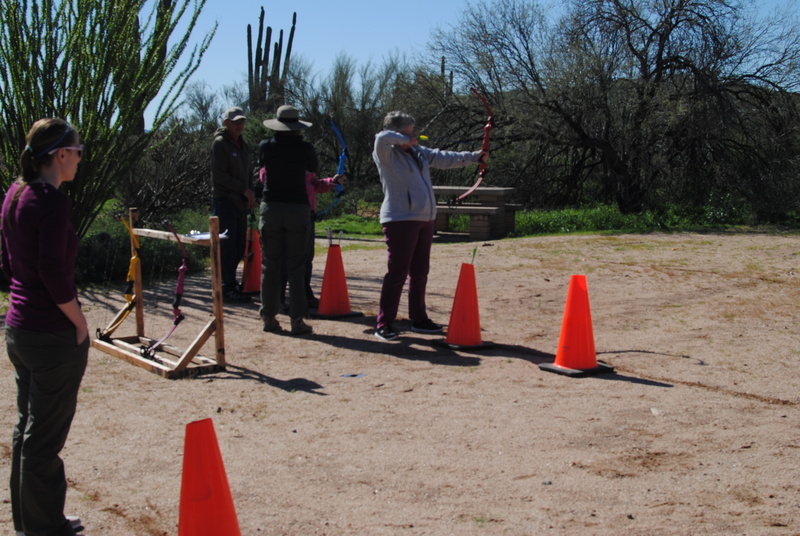 Then it was time for more practice for me, as my fellow host, Julie, (shown in the picture below this one in the pink), took her turn…. 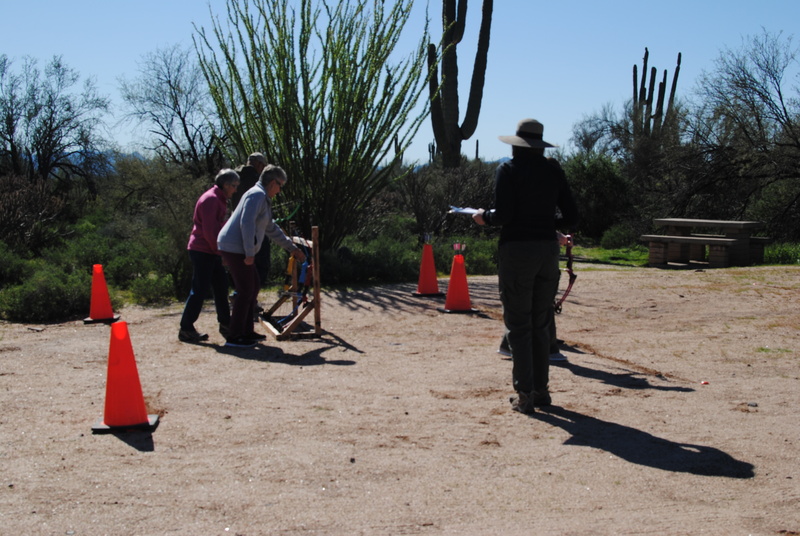 Big THANK-YOU to our McDowell Mountain Regional Park, Ranger Amy, for taking this time out of her busy day/week to share her knowledge of this fun sport, Archery! 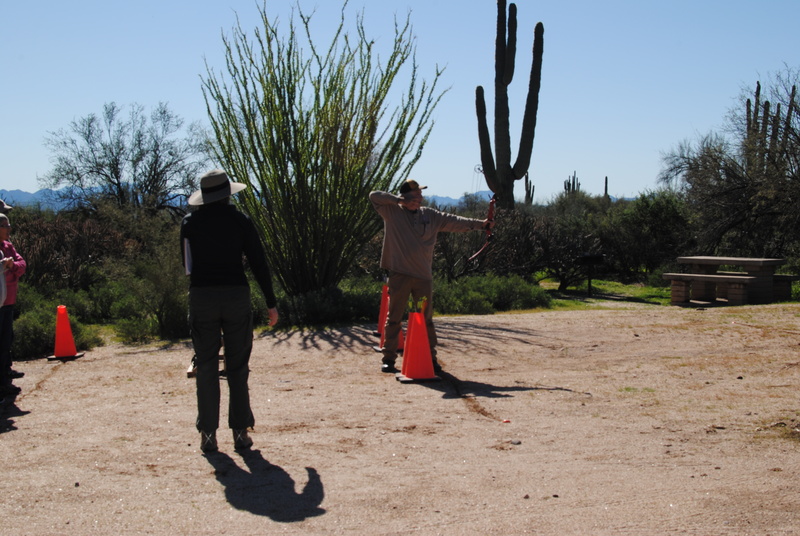 Still Lovin this retirement life, and looking forward to many more years of happy, carefree, retirement travel.